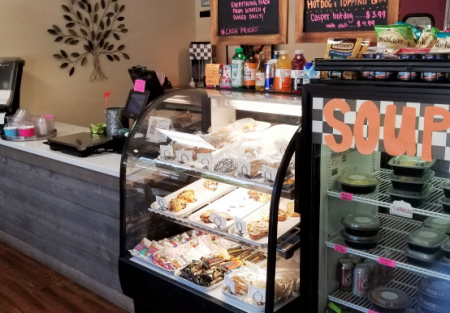 Self Serve Yogurt shop for sale that also sells baked goods and lunch items in South Placer County! Low Price for a newly outfitted Yogurt and more shop - perfect for family or owner operator! Seller opened for business in 2017 from scratch...with sales increasing each month. Current Owner works 6 days a week with Sundays off, 40 hours total. A significant initial investment can be yours for a fraction of the costs of equipment and tenant improvements. This area is above the fog and only about 30 minutes to Roseville. Freeway close and easily accessed and utilized by travelers to Reno and Tahoe. This small town has an ideal family friendly atmosphere with a new hotel scheduled this year next to the shop. There is also a new subdivision in the works. Get in cheap and enjoy the profits as community continues to grow and year round traffic to Reno/Tahoe increase your sales. Winter months are supplemented with ski season traffic that is unusual for a yogurt shop during low season. You can make money all year long. Great Reviews: Social media media in place with lots of great reviews. Technology in place with the latest apps for scheduling and POS to keep track of sales and transactions. All the hard work of getting this shop up and running and grown into a thriving business is done. Jump in now and reap all the rewards. Menu: Self serve Yogurt, bakery goods, hot dogs ect...All custom recipes are included with sale, but bring your own talents to the shop and move it to the next level. The area needs a special events bakery and seller will educate a new owner on the potential. FFE: Included in sale...POS, Cooler and freezers, hot dog steamer, Soup warmer, dry topping display, moffat oven, safe, survellance system...High end Carpigiani soft serve machines with glycol installed, that produce a firmer and creamer product. Soft serve machines alone are worth $30K. Sales: Sales have been increasing each month with May 2018 Gross sales around $18K...business opened in Oct. 2017. Lease terms: Low Rent-$1,200 for a well designed 950sqft. Bring your creativity and talents and enjoy owning your own store!. Owner training available: Seller will proved up to 25 hours per week for two weeks, included with sale. Consult for up to 30 days to help you continue your success. Good employees who enjoy working at the shop as well. Lead staff is trained in all bakery and lunch duties. Staff can prepare all product and will support new owner. Sales will be provided to qualified buyers...sales will not be a condition of sale as this FFE & Ti's are worth over $100K. This is the high season for this shop and now is the time to make your offer before someone else snaps it up. Low Price and Low Rent!